Facebook hasn’t released any official client for iPad yet, this is probably because their CEO and Founder Mark Zuckerberg believes that iPad isn’t as mobile as our smartphones. This has surely given other developers the opportunity to create their own Facebook apps for iPad. 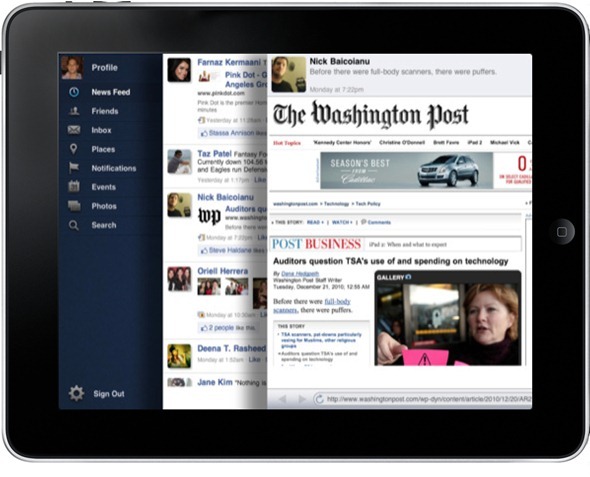 For example, ‘Friendly for Facebook’ is one of the most popular Facebook app for iPad. And now, Facepad is a new challenger in the game. Facepad for iPad was released last week and it has clearly taken some design clues from the popular Twitter client called Twitter for iPad. The similarities are obvious, but not in a bad way. The app works using windows or tabs, so you can open multiple profiles and check them out in seconds. People who have used this app seem to have really like it. It has had over a million ad impressions in its first twelve hours of release. This doubled after twenty-four hours, and now it is the 15th most popular app on the iTunes App Store. Best of all, it is available for free. Follow the link below to download it right now!